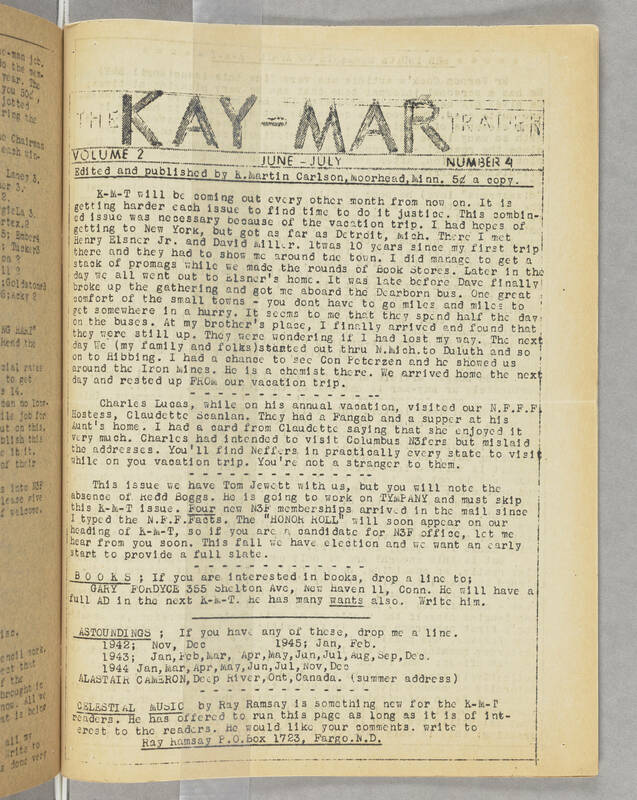 THE KAY-MAR TRADER VOLUME 2 JUNE-JULY NUMBER 4 Edited and published by K.Martin Carlson,Moorhead,Minn. 5[[cent symbol]] a copy. K-M-T will be coming out every other month from now on. It is getting harder each issue to find time to do it justice. This combined issue was necessary because of the vacation trip. I had hopes of getting to New York, but got as far as Detroid, Mich. There I met Henry Elsner Jr. and David Miller. Itwas 10 years since my first trip there and they had to show me around the town. I did manage to get a stack of promags while we made the rounds of Book Stores. Later in the day we all went out to Elsner's home. It was late before Dave finally broke up the gathering and got me aboard the Dearborn bus. One great comfort of the small towns - you dont have to go miles and miles to get somewhere in a hurry. It seems to me that they spend half the day on the buses. AT my brother's place, I finally arrived and found they were still up. They were wondering if I had lost my way. The next day We (my family and folks)started out thru N.Mich.to Duluth and so on to Hibbing. I had a chance to see Con Peterzen and he showed us around the Iron Mines. He is a chemist there. We arrived home the next day rested up FROM our vacation trip. - - - - - - - - - - - - - -- Charles Lucas, while on his annual vacation, visited our N.F.F.F. Hostess, Claudette Scanlan. They had a Fangab and a supper at his Aunt's home. I had a card from Claudette saying that she enjoyed it very much. Charles had intended to visit Columbus N3fers but mislaid the addresses. You'll find Neffers in practically every state to visit while on you vacation trip. You're not a stranger to them. - - - - - - - - - -- - - -- This issue we have Tom Jewett with us, but you will note the absence of Redd Boggs. He is going to work on TYMPANY and must skip this K-M-T issue. Four new N3F memberships arrived int he mail since I typed the N.F.F.Facts. The "HONOR ROLL" will soon appear on your heading of K-M-T, so if you are a candidate for N3F office, let me hear from you soon. This fall we have election and we want an early start to provide a full slate. - - - - - - - - - - - - - B O O K S ; If you are interested in books, drop a l ine to; GARY FORDYCE 355 Shelton Ave, New Haven 11, Conn. He will have a full AD in the next K-M-T. He has many wants also. Write him. _____________________ ASTOUNDINGS ; If you have any of these, drop me a line. 1942; Nov, Dec 1945; Jan, Feb. 1943; Jan,Feb,Mar, Apr, May,Jun,Jul,Aug,Sep,Dec 1944 Jan,Mar,Apr,May,Jun,Jul,Nov,Dec ALASTAIR CAMERON, Deep River, Ont,Canada. (summer address) - - - - - - - - - - - - - CELESTIAL MUSIC by Ray Ramsay is something new for the K-M-T readers. He has offered to run this page as long as it is of interest to the readers. He would like your comments. write to Ray Ramsay P.O.Box 1723, Fargo,N.D.